Earlier in August, Hulu announced that the company would be moving to a subscription-only model, gradually phasing out its free tier -- which let users watch the most recent episodes of shows after they aired live on TV -- over the subsequent weeks. Thanks to a partnership with Yahoo, Hulu's free service continues in a website and, recently launched by the company, a free iOS app called "Yahoo View." The mobile app appears to be a noticeably tampered-down experience, however. According to TechCrunch, "due to streaming rights" the app only has short clips and trailers from well-known shows, late-night comedy, sports, and news programs, but it doesn't let users watch full-length TV episodes of anything besides certain anime series. The website version does offer full episodes, but users have to wait eight days after each episode originally airs live on TV for it to appear on Yahoo View. 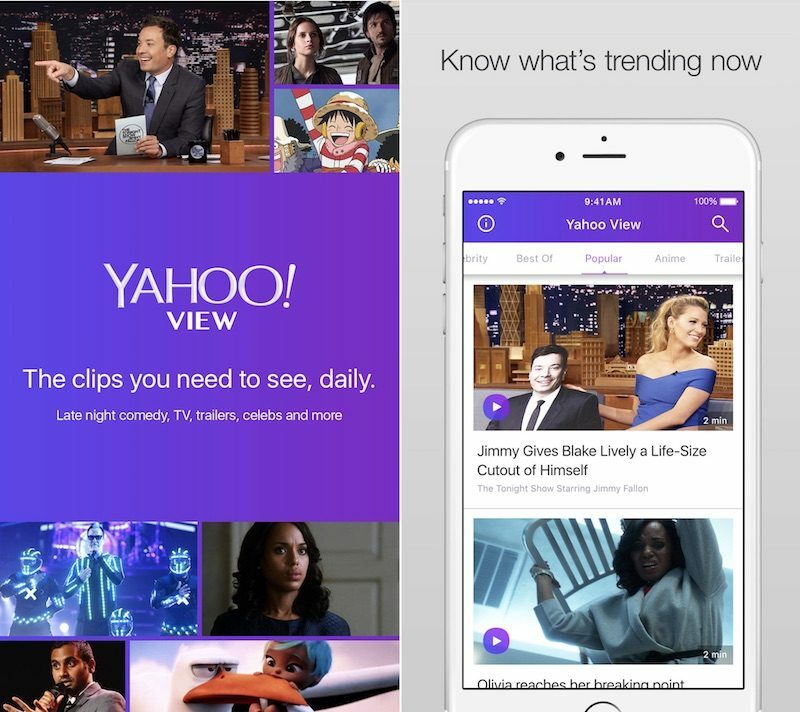 Featuring Hulu content, the Yahoo View app brings you thousands of clips on-the-go and lets you be the first to see the hottest videos. Watch the latest must-see clips in comedy, late night talk shows, celebrity & entertainment, news and movie trailers. Don’t miss a single moment from your favorite TV shows like The Tonight Show Starring Jimmy Fallon, Dancing With The Stars, The Voice, Law & Order: SVU, New Girl, Black-ish, Modern Family, Empire, Grey’s Anatomy and many more. The website version of Yahoo View also includes a "Beyond the Episode" feature that lets users navigate GIFs, previews, clips, and spoiler discussions for the episode they just watched, all content integrated with Tumblr, which the iOS app lacks. The launch of Yahoo View on iOS coincides with an unfortunate news story surrounding the company, which is expected to soon confirm a "massive data breach" that is threatening the exposure of 200 million user accounts. The hack, which includes user credentials dating back to 2012, could potentially cause trouble for the $4.8 billion sale of Yahoo's core business to Verizon, announced over the summer. But there’s nothing smooth about this hack, said sources, which became known in August when an infamous cybercriminal named “Peace” said on a website that he was selling credentials of 200 million Yahoo users from 2012 on the dark web for just over $1,800. The data allegedly included user names, easily decrypted passwords, personal information like birth dates and other email addresses. Although unconfirmed, a source speaking to Recode suggested the hack could target over 200 million user accounts, with the potential for more. “It’s as bad as that,” said one source. “Worse, really.” The company has yet to call for a wide user password reset, but sources close to the matter believe that "Yahoo might have to, although it will be a case of too little, too late." The Yahoo View app is available to download on the iOS App Store [Direct Link] for free, and an Android version is expected to launch sometime soon. What does this mean, if you have used a yahoo account since 2012, your data might have been compromised? Or if you have created an account since 2012, your data might have been compromised? I have a yahoo account that I created in 2001 but I never use it anymore. Although, I think about a decade ago, I changed all my personal information to the wrong stuff anyways when my ex-wife was trying to spy on my account by resetting my password using my information that she knew. So, if someone has it, it is most likely is not correct information. Boo-hoo Hulu, Yahoo go poo-poo. Haven't gotten any notices for my ancient sbcglobal account. I've been getting frequent emails from Yahoo lately telling me that a login was attempted from an unrecognized device. I have two Yahoo accounts and receive this notice on both of them almost every day. Friend of mine who is an avid photographer lost her email and Flickr—all her photos and albums and followers. Someone stole her password and changed it, and Yahoo would not/could not help. This was a few months ago, but it could well be the same 2012 breach. Reminds me again to NEVER use the same password two places (good luck getting my friends/family to follow suit). And to favor companies that take security and privacy the most seriously. I hope some form of Yahoo recovers. Flickr is a good product. I even like Yahoo mail (and thanfully have a post-2012 password and no suspicious login attempts so far). Heck, Yahoo View even has its uses for me—I used to watch my network TV shows mainly on Hulu, and now it will be this!